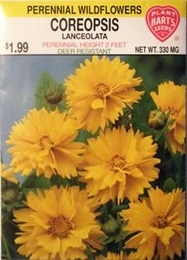 Common name Tickseed, this Coreopsis is a hardy perennial that generally blooms the first year from seed. The beautiful large yellow flowers will bloom uninterrupted on established plants until frost. Flowers are borne on long stems and if cut young will last for several days in water. Wildflowers require little care. Water only when necessary. For additional plants divide clumps after 2 to 3 years of flowering. Thinning - when plants are 3 inches tall thin to 12-15 inches apart.